To Cite: Peyvandi A A, Khoshsirat S, Safaei A, Rezaei-Tavirani M, Azodi-Zamanian M. Interactome Analysis of 11-Dehydrosinulariolide-Treated Oral Carcinoma Cell Lines Such as Ca9-22 and CAL-27 and Melanoma Cell Line, Int J Cancer Manag. 2017 ; 10(7):e10096. doi: 10.5812/ijcm.10096. Background: Oral squamous cell carcinoma (OSCC) is one of the most common malignancies in head and neck. The patients usually have a poor prognosis because they do not understand the significance of early symptoms. Then, the timely treatment may be lost. In recent years, network analysis is growing in the target identification concepts and can provide opportunities in pathway analysis. These could provide valuable information for drug development and progression monitoring of cancers such as OSCC. Methods: PubMed Database was used as the main source and “Oral cancer” and “11-dehydrosinulariolide” and “Proteomics” were the keywords for the search process. We focused on articles that studied the differentially expressed proteins of cell lines of OSCC (Ca9-22 and CAL-27) and melanoma cell line (A2058) after 11-dehydrosinulariolideon treatment. The topological features of differentially expressed proteins were analyzed using Cytoscape Version 3.4.0. Module selection of the protein-protein interactions (PPI) networks was done using MCODE plug-in. In addition, gene ontology (GO) enrichment analysis of modules in related PPI networks was assessed. Results: Network analysis show that UBC, HSPA5 and GAPDH are the common central proteins between the three treated cell lines. The GO terms of the gene list of each of the correlated modules of networks are mostly related to four functions such as protein folding and assembly, metabolic processes, translation, and apoptotic pathways. Conclusions: Despite introduction of different protein panels related to the effect of 11-dehydrosinulariolide on cancerous cell lines in the previous studies, here a common biomarker panel is represented. Oral squamous cell carcinoma that is one of the most common malignancies in head and neck can be treated by chemotherapy, surgical operation, radiotherapy or combinations of the treatments. The patients usually have poor prognosis and survival rate in 5 years is about 50% (1, 2). The most important risk factors for OSCC are drinking alcohol, use of tobacco, diet low in fruits and vegetables and infection with high-risk human papilloma virus (HPV) (3). OSCC is most frequently diagnosed late in the course of the disease because patients do not understand the significance of early signs and symptoms (4). In Western countries, OSCC affects the floor of the mouth in 15% - 20% of the cases and the tongue in 20% - 40% of cases and together these sites account for about 50% of all cases of OSCC (5). Introducing the early diagnosis biomarkers of oral cancer is essential in obtaining a better prognosis and quality of life of affected patients (6). Several researchers have investigated the molecular aspects of OSCC such as genomics and proteomics studies (7, 8). HMGB1 polymorphism 1177G/C (7), CTLA-4 gene polymorphism (9) and CYP1A1 exon 7 containing G allele (10) were at increased risk for OSCC. Tropomyosin 2, myosin light chain 1, alpha B- crystallin, heat shock protein 27, stratifin and flavin reductase have significantly been reported over-expressed in OSCC (11). Melanoma is a malignant tumor of cutaneous melanocytes. Incidence of melanoma is usually lower than other skin cancers such as basal cell cancer and squamous cell cancer. However, melanoma is more invasive and has a higher lethality than other skin cancers such as Squamous cell carcinoma skin (12). Squamous cell carcinoma (SCC or SqCC), also known as squamous cell cancer, is cancer that begins from squamous cells, a type of skin cell. Cancers that involve head and neck such as oral cancer, are most often squamous cell cancers (13). Despite the various previous studies in this filed, yet special prognostic biomarkers are to be introduced, which could be used in diagnostics and, consequently, in the selection of the most effective treatment (14). A main challenge of cancer study is to organize the selection of cancer drug targets (15) but with advances in PPI discovery targeting agents. In clinical settings the importance of PPI study as an anticancer strategy has become a reality concept (16). Recently PPI network analysis of many diseases and disorders has attracted growing attention of scientist in medicine (17-19). Molecular biology plays a principal role in validation of target identification, concepts and pathway studies. Network science not only can elevate our view of cell biology (20) but also it is one of the mechanisms that can clear the aspects of pathogenesis (21-26). We want to reveal 11-dehydrosinulariolide effect on oral cancer with squamous cell carcinoma origin and melanoma cancer with different origin of Squamous cell carcinoma. It can provide the opportunity to investigate the similarities and differences of response to same treatment in cancers with different origins. In this study, a PPI network analysis was performed to investigate the effects of 11-dehydrosinulariolideon (anti-cancer drug) on oral cancer cells (Ca9-22 and CAL-27) and melanoma cells (A2058 Cell line). Overall, these results can provide clues for the investigation of the molecular mechanisms of the anti-tumor effects of 11-dehydrosinulariolide on the mentioned cancer cells and could provide valuable information for drug development and OSCC treatment timely. Data collection: We used the PubMed Database as the main source for literature search by “Oral cancer”, “11-dehydrosinulariolide” and “Proteomics” as key words. The inclusion criteria were the studies on the effect of 11-dehydrosinulariolide on the cancerous cell line such as oral cancer cells (Ca9-22 and CAL-27) and melanoma cells (A2058 Cells). In fact, cancer cell lines cultured in vitro are considered as valuable resources. The studies involved in the comparison between the treated mentioned cancer cell lines versus non-treated ones are also taken into consideration. Exclusion criteria were literature reviews and studies on samples of biological fluids, including serum, plasma, urine and plasma after treatment, and studies only involved in tumor and normal ones. We manually carried out the evaluation of publications in line with the above conditions. The proteins of oral cancer cells are identified by LC-MS/MS (27, 28) and for melanoma cells (29) it used western blot. The extracted proteins were collected in Table 1. Between the three treated cell lines, there is only one common differentially expressed protein named GRP 78 (see Table 1). To avoid the loss of protein interactions, we used a combination of multiple databases to construct the network. 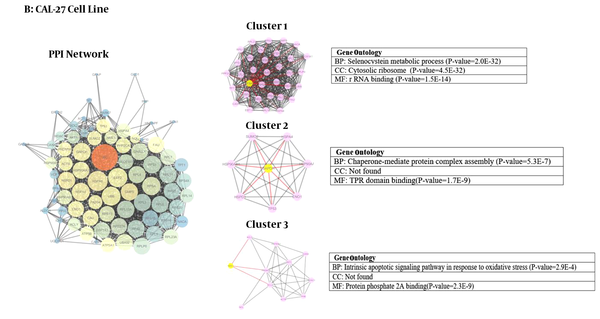 We made use of the Cytoscape (30) bioinformatics tool to form the PPI networks. The nodes represent the proteins and the edge identifies the relationship between proteins. In this study, degree and betweenness centrality (BC) are considered as analysis parameters. There are two important concepts in the PPI network studies (31). The degree is the number of links that connect to a node and The BC value is a function of the number of shortest paths that pass through each node in a network (18). In this study, we considered 10% of total nodes with high degree as hub and the hub with BC value ≥ 0.01 was considered as Hub-bottleneck protein. Biological networks containe several subnetworks that contribute to various biological processes. A subnetwork may have crucial impact on the global network (14). Therefore, we used MCODE (a plug-in for Cytoscape) to cluster the whole network to identify densely connected regions (modules). Node score cut-off, 0.2, degree cut-off, 2; k-core, 2; and max depth, 100 were the parameters for creating modules. After identification of modules in the PPI networks, Gene Ontology was performed. ClueGO integrates GO terms and creates a functionally organized GO/pathway term network. It can analyze genes and comprehensively visualized functionally grouped terms (32). Kappa statistic ≥ 0.4, enrichment and Bonferroni step down method were used for probability value correction (33). We used Cytoscape, version 3.4 (30) to obtain three networks of differentially expressed proteins: for CAL-27 and Ca9-22 as OSCC cell lines and A2058 as melanoma cell line as treatment cells by 11-dehydrosinulariolide in comparison with the untreated cell lines (Figures 1 - 3). Topological analyses of the networks showed that there are seven, eight and six hub-bottleneck nodes for Ca9-22, CAL-27 and A2058 cells networks respectively (see Table 2). In Figure 4, the key proteins of the three analyzed networks are represented schematically. The yellow cycle in modules correspond to the relative seed. In PPI network, the larger circles refer to the highest degree and blue to brown color refers to increment of BC. The PPI network contains 70 nodes and 1221 edges. The yellow cycle in modules correspond to the relative seed. In each PPI network, the larger circles refer to the highest degree and blue to brown color refers to increment of BC. The network includes 77 nodes and 1176 edges. The yellow cycle in modules correspond to the relative seed. The larger circles refer to the highest degree and blue to brown color refers to increment of BC. PPI network contains 60 nodes and 1116 edges. aThe data are sorted according to degree score. Figure 4. 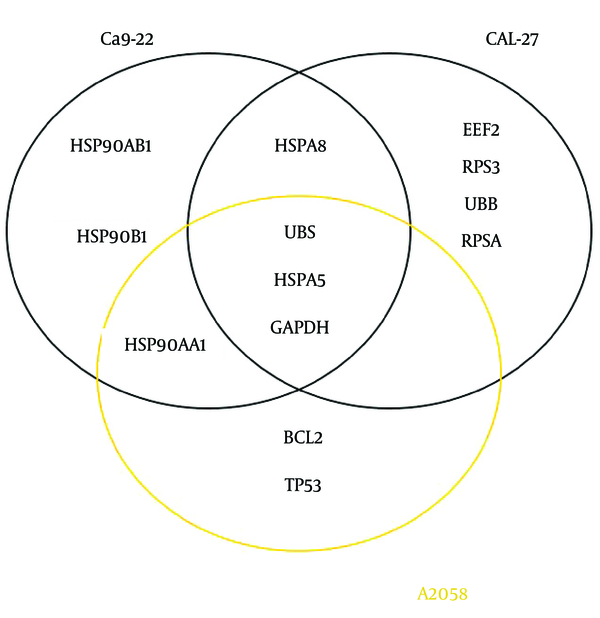 The Special and Common Key Proteins in PPI Networks of 11-Dehydrosinulariolide-Treated Oral Carcinoma Cells (Ca9-22 and CAL-27) and Melanoma Cells (A2058 Cell Line) are Shown. Module and GO analysis: Modules were obtained based on the MCODE analysis according to default parameters that are mentioned in material and method session. Nine modules including three modules for each network were obtained using the default criteria. PDIA3, CDK2 and CANX are the seeds of the three clusters of Ca9-22 network. RPS 4X, GAPDH and NME1 are the seeds of three clusters of CAL-27 PPI network and for melanoma cells network the seeds are ALB, CASP12 and DDIT3 (in Figures 1 - 3; yellow cycle in clusters indicate the seeds). Functional analysis was done using GO enrichment analysis for biological processes (BP), cellular component (CC) and molecular function (MF) of obtained modules (the findings are presented in Figures 1 - 3). 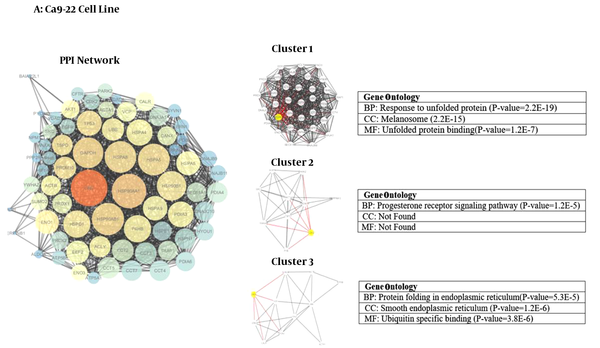 Protein-protein interaction network analysis has an important role in cancer studies to determine therapeutic targets and early diagnostic biomarkers. It can introduce proteins that are critical for initiation and maintaining characteristics of cancer cells (16). Obtained data from PPI network analysis could provide clues for the investigation of the effects of the drug treatment and further understanding of the mechanisms at the molecular level (34). As it is depicted in Table 1, the numbers of 21, 28 and 15 changed expression proteins are introduced for Ca9-22, CAL-27 and A2058 cell lines after treatment with 11-dehydrosinulariolide respectively. There are limited common proteins related to the three studied cell lines; however, the large number of proteins is introduced. On the other hand, it is not clear which proteins play crucial roles corresponding to the effect of drug. Construction and analysis of PPI networks for the introduced proteins relative to each cell line can provide useful information. As it is shown in Figures 1 - 3, PPI network of Ca9-22 and CAL-27 cell lines of OSSC are constructed with 70 nodes and 1221 edges and 77 nodes and 1176 edges respectively. The network of A2058 cell line of Melanoma contains 60 nodes and 1116 edges. There are 17, 15 and 19 links per node for Ca9-22, CAL-27 and A2058 cell lines networks respectively. Topological analysis of the network is a useful tool for ranking and screening of the nodes (35). One analytical criteria in PPI network analysis is the degree which can be introduced as the main central parameter (36). So the top 10% of the nodes based on degree values selected as hub proteins (see Table 2). Betweenness, the other central parameter was chosen for more resolution. The nodes with betweenness value ≥ 0.01 are considered as bottleneck proteins. The proteins that are hub and bottleneck nodes are introduced as hub-bottleneck proteins. Experience shows that the hub-bottleneck proteins play crucial roles in the network (31). As it is represented in Table 2, there are 7, 8 and 6 hub-bottleneck proteins for Ca9-22, CAL-27 and A2058 cell lines networks respectively. Interestingly, in the networks of Ca9-22 and CAL-27 cell lines the highest score of degree and BC belong to UBC. The top hub-bottleneck node in PPI network of A2058 cell line of Melanoma is HSPA5 (see Table 2). Since in this network amounts of betweenness for UBC and HSPA5 nodes are equal and difference in degree values is less than 4%, UBC can be considered as top hub-bottleneck node in PPI network of A2058 cell line. Despite major differences between the three treated cell lines based on the kind of the introduced proteins (see Table 1), there are common hub-bottleneck nodes between them. As it is shown in figure 2, UBC, HSPA5 and GAPDH are the common central proteins between the networks. BCL2 and TP53 are central nodes of A2058 cell line; in a way that EEF2, UBB, RPSA and RPS3 for CAL 27 are special nodes. UBC as the major central protein in the three networks is included during stress and provides extra ubiquitin necessary to remove damaged/unfolded proteins (37). The other common hub-bottleneck protein between three cell lines with the same treatment is HSPA5. It probably plays a role in assembling protein complexes inside the endoplasmic reticulum and also involves in the degradation of misfolded proteins and correct folding of proteins (38). GAPDH is the other common hub-bottleneck in PPI network analysis of OSCC and melanoma cell lines after treatment by 11-dehydrosinulariolide. GAPDH, in addition to metabolic function, has a role in apoptosis induction (39). Various groups of proteins were obtained after PPI network analysis as key proteins in the mentioned cell lines after treatment by 11-dehydrosinulariolide. Stress related proteins such as molecular chaperones (HSPs) and UBC and the other apoptosis and ribosomal proteins (BCL2, TP53, RPSA and RPS3) are highlighted. 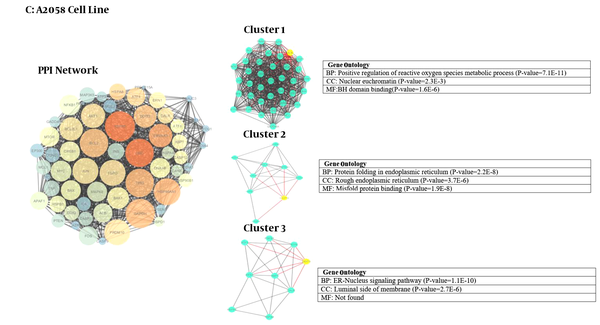 According to GO analysis, three clusters are identified in each network (see Figures 1 - 3). For network of Ca9-22 cell line, the genes in most significant module (cluster1) were mainly enriched in response to unfolded protein (P = 2.2E-19) and most significant CC and MF were melanosome (P = 2.2E-15) and unfolded protein binding (P = 1.2E-7), respectively. For CAL -27 cell line network, the genes in the most significant module (cluster1) were mainly enriched in selenocystein metabolic process (P = 2.0E-32) and most significant CC and MF were cytosolic ribosome (P = 4.5E-32) and rRNA binding (P=1.5E-14), respectively. Positive regulation of reactive oxygen species metabolic process (P = 7.1E-11) was the biological process of the enriched genes in most significant module for melanoma cell line. Also in cluster 1, the nuclear euchromatin (P = 2.3E-3) and BH domain binding (P = 1.6E-6) have the most significant score for CC and MF, respectively. After analyzing the networks of treated cell lines to explore the potential molecular mechanism of 11-dehydrosinulariolide, GO functional and pathway enrichment analysis were performed. The GO terms that appeared enriched in the gene list of each of the correlated module of networks are mostly related to four functions such as protein folding and assembly, metabolic processes, translation, and apoptotic pathway. Despite the differences in cellular component between three cell lines with the same treatment assay, endoplasmic reticulum (ER) is the common place (Figures 1 - 3). ER is an essential cellular compartment for protein synthesis and folding. Recent studies emphasize that ER, a subcellular compartment, participates in the intrinsic apoptotic pathway and sending signals to the nucleus for the unfolded protein response (40, 41). The biological process of modules in three cancer cell lines also suggests that the response to unfolded proteins in ER may be altered through 11-dehydrosinulaeriolide treatment. In addition, the molecular functions of involved proteins in clusters are different. In the body of literature, there are different protein panels related to the effect of 11-dehydrosinulariolide on cancerous cell lines. In the present study, a common protein biomarker panel including UBC, HSPA5 and GAPDH is suggested for effect of 11-dehydrosinulariolide on OSCC cell lines (Ca9-22 and CAL-27) and melanoma cells (A2058). However, more investigation in the field is required for validation of the finding.